Isaac Albeniz (1860-1909)? Piano Music, Vol. 5 (Naxos 8.573293)? Yes. I've been preoccupied with other releases so have missed first first four volumes. 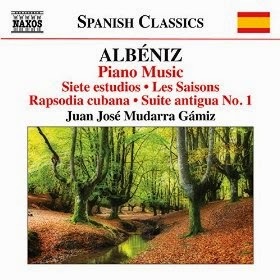 But based on this one, with the very well-suited Juan Jose Mudarra Gamiz at the piano, this is some pretty excellent coverage. The fifth volume explores Albeniz in the days when he was making his way as a piano virtuoso, 1881-1892. As a composer for the piano he was essentially working in an advanced salon mode. So it was music designed to please, not music to upset the apple-carts of expectation. Yet the promise of his music can be heard plainly and rather delightfully here. There is rhythmic vitality, a kind of punchiness that comes out of the way he channeled his Spanish heritage. And there are glimpses of the colorful French influence, his take on impressionism, not fully realized but still latent. So in spite of the limitations he imposed on himself, his need for a certain accessibility, this early music has a great deal of charm and a vivid melodic directness. Juan Jose Mudarra Gamiz goes quite a ways with these deceptively straightforward pieces. He gives them a sharply rhythmic snap when it is called for, shaping the musical momentum and definition with appropriate, directly charged forward motion. So if these may not show us the mature, fully developed Albeniz, they give insights into his beginnings and have a good deal of charm and fresh air, a lyricism and tunefulness that was to come out ever more originally in subsequent works. The other volumes cover the later masterpieces and no doubt are more essential. Volume 5 gives us a lesser-known but vivid set of works most of us have not heard before in sparkling renditions. And that is worthy and valuable in itself. Of twentieth-century Polish composers there are many, many fine ones. The later modernists were at one time dominated by Penderecki, for various mostly good reasons, but here in the States we heard less of Lutoslawski (1913-1994) and very little of Panufnik. Happily we celebrate the 100th birthday for Panufnik (1914-1991) this year, so all who are curious are getting the chance to know the composer more intimately (type his name in the search box above and you will see some of the new releases that I have posted on thus far). At the same time Lutoslawski's music has surged in terms of recorded performances in the last few decades. So we are learning much more these days about the later 20th-century modern movement there. With a new Naxos (8.573164) release we get to hear all three string quartets by Panufnik coupled with Lutoslawski's only work in the medium, all played nicely by the Tippett Quartet. What the disk does in a nutshell is affirm Lutoslawski's stature in the modern pantheon, but it also gives us a chance to see the chamber side of Panufnik in great depth, with three excellent quartets that have been rather neglected in the discographies. And he fares very well with these works on close listening. The Panufnik quartets each have a character of their own. No. 1 (1976) is a rather somber affair; No. 2 "Messages" (1980) has a bit more flow, as it is based on how Panufnik in his youth was fascinated by the sound he heard when he put his ear to a telegraph pole, as he listened to the humming caused by the wind setting the wires in motion. No. 3, "Wycinanki" (1990), generates musical impressions of traditional Polish folk paper-cut art. All three have some of the structural strengths of the mature Panufnik. A serialist he isn't, but he often organizes works around a sort of generative grammar of particular intervals or motives, a structural tendency that gives the music an inherent logic. The listener may not be aware of the limitations Panufnik sets for himself in such a work, yet there is long-form continuity and contrast. These three works (affirmed by reading the liner notes) do not have rigorous motival schemes in the literal sense, yet there is coherent musical discourse throughout that builds on motival-intervalic logic. There is great strength and subtlety in the three quartets. All told they show a master musical mind at work, Panufnik at his mature best. The Lutoslawski string quartet extends the idea of a modern abstract, coherent discourse in its own way. The two-movement quartet from 1964 is his only work in this configuration. It has a more cosmically expressive dynamic that makes for a fitting end-point to the program. One wishes he wrote more quartets and it is equally true for me of Panufnik. We have these four works to experience and relish in any event. The Tippett Quartet gives us fine readings, detailed yet woven into whole cloth, the patterns and changes brought out in sharp outline. With the Naxos price, this CD gives you much to explore and appreciate without eating into your retirement savings, or your nest egg in general, assuming you have one! It is a most valuable addition to any self-respecting modernist's collection, with works you may well want to return to continually, each time gaining something new from the experience. Get this one! Composer Mohammed Fairouz undoubtedly is a leading light among the younger composers working today. We've already come across two disks dealing in whole or part with his music (type his name in the search box above for those posts), now we encounter one of his most ambitious, a recording of his Poems and Prayers, otherwise known as his "Symphony No. 3", plus the related "Tahrir" for clarinet and orchestra (Sono Luminus 92177, CD and Blu-ray set). "Tahrir" (2011) refers to the Egyptian uprising in Tahrir Square, Cairo, 2011. 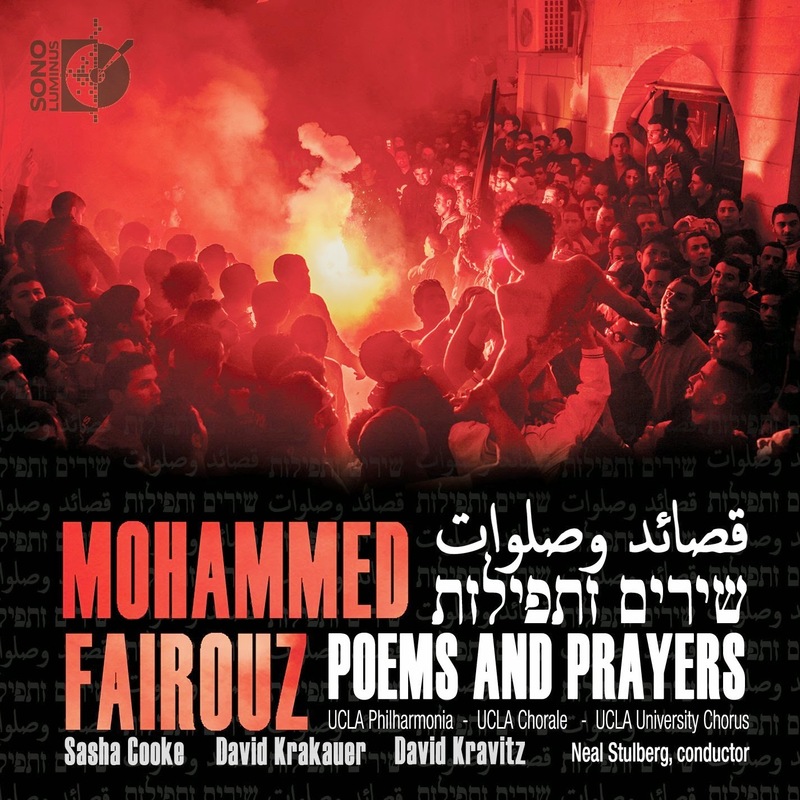 The word means "freedom" and Fairouz commemorates the event with music that is in part informed by and structured on Mozart Piano Concerto K. 482 (the first to include a clarinet) and also his Clarinet Concerto K. 622, but does so with the clarinet and orchestra taking on the modes and flavor of traditional mid-eastern music. David Krakauer does an excellent job realizing the clarinet part. The music cleverly and delightfully sets the stage for the larger work to come, "Poems and Prayers". The symphony (2010) has a great gravity to it, as it both mourns the deaths in the Israeli-Palestinian conflict and prays for peace in that region. Appropriate texts in both Hebrew and Arabic alternate, including a Kaddish. The texts reflect and correspond to the music of both nationalities on top of a sort of neo-classic, neo-romantic expressiveness and attention to form. Mezzo-soprano Sasha Cooke and baritone David Kravitz have important roles in conjunction with the massed choirs of UCLA along with the Philharmonia, all conducted in a moving performance by Neal Stulberg. In light of recent events in the region, the message of the music becomes even more urgent and contemporary. The music itself is quite effectively eclectic with modern tonality alternating with mid-eastern modes in ways that move the emotions and express the concern, horror and dismay one may well be feeling as a listener prior to coming to this music. As with most other Sono Luminus releases the set comes in a standard two-channel performance on CD and a 5:1 version on Blu-ray. I have not been able to audition the latter, but I can imagine that it makes for an even more poignant experience. Mohammed Fairouz lives up to his promise as a contemporary composer of talent, creativity and even brilliance on this disk. This is not music of a happy sort, but the world has been in the throes of tragic events and Fairouz captures that feeling with a prayer for redemption that all of us can appreciate and fervently hope for. Not every album changes the world. That's fitting because world-changing events are not something we can handle on a daily basis without overload. Today's album has no intentions of a foundational reworking. But that is not to say it is in any way ordinary or everyday. It's a series of works for three contrabasses by Christopher Roberts. Trios for Deep Voices (Cold Blue 0030) comes in part out of the insights and impressions gained from an extended visit by the composer to the Star Mountains in Papua New Guinea. His participation in and appreciation of the primal local music and the sounds of nature there gave him pause and were inspirations for these five contrabass trios. Roberts extends the range of the three instruments by utilizing harmonics extensively. In this way there are the expected deep bass notes but also an upper range to work with. The music has some repetition but like the traditional music of New Guinea the horizontal prosody of A-to-B discourse is predominate. There are intervallic primes along with a compositional inventiveness that makes this music belong more to the realm of radical tonality than minimalism. 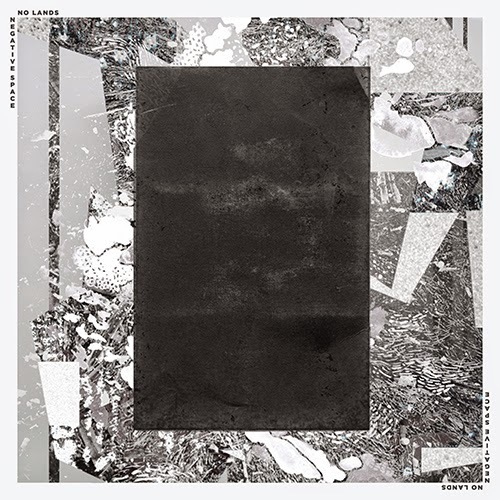 The sound of the bowed contrabasses (played by the composer, Mark Morton and James Bergman) has the effect of creating an ethereal dream world that nonetheless has a robustness born of the physicality of the instruments played together. The music comes together and rewards the attentive listener with a sound all its own. There is much to appreciate. I eventually found myself falling more and more deeply under its spell. I think perhaps there will be plenty of others who will feel the same way after deep listening. 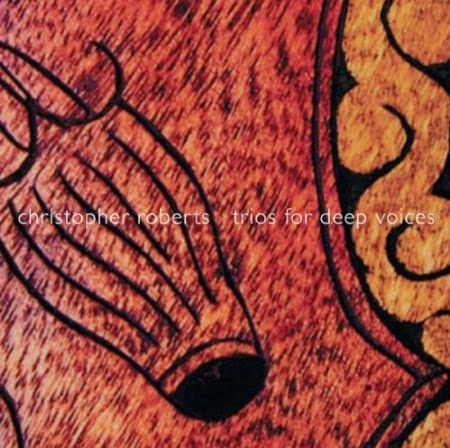 As much as someone like me loves the sound of the contrabass, in time I heard the trios as music that goes beyond instrumentation to a contemplative space, as the composer no doubt intended. In keeping with the theme Friday, today another musical presentation that combines new music classical with cross-genres, in this case jazz-rock. 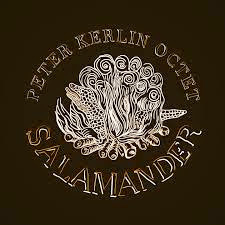 Peter Kerlin composes the music and plays bass on the Peter Kerlin Octet and the highly creative five-work set entitled Salamander (Innova 879). There are plenty of predecessors for this sort of hybrid. Multi-reed composer Eric Dolphy had in his last stages of his career a remarkable compositional new music stance combined with avant jazz on recordings such as Out to Lunch back in the mid-'60s. And there have been others. Peter Kerlin channels what has been done and comes through with his very own way. The Octet goes for a wide-ranging through-composed suite of works that are in some ways minimalist and post-modern but with the energy, openness and charge of jazz-rock. The players in this ensemble all seem to have a jazz background, so that the playing of the music has a looseness and freedom and includes I can presume more than just what has been written/pre-arranged. Though the total personnel comes to a bit more than an octet--three bassists, two vibraphonists, three violists, an organist and two drummers--the idea of the initial instrumentation must have been eight-part and others added or subtracted as needed in the recording-realization process. No matter. Drummer Mike Pride and violist Jessica Pavone are the more well-known players here, both with a good deal of new jazz cred, but the group sound has that as part of the major thrust throughout. Kerlin brings in inventive, attractive motives, generally subjects them to mesmeric repetition, with vivid ensemble colors. The filling out with atmospheric tones and improvisatory flourishes makes this much more than minimalism in some predictable sense. It is almost like a series of musical solar systems, with some things in orbit around a center and other non-circular entrances (like meteor showers or cosmic rays subject to different trajectories?) coming through the various zones for a series of mini-universes of sounds. The music bears very well repeated hearings. Anyone with a sense of possibilities and an openness to the new will find this music as pleasurable as it is innovative. I hope we can hear more of this sort of music from Peter Kerlin in the near future. The beauty of the idea behind the old adage "you can't step in the same stream twice" is not only that it is true. It also means that you can go back to the same places later on and you find renewal possible, even actual. That's the feeling I get listening to cellist Maya Beiser and her album Uncovered (Innova 900). On it she chose ten rock and blues classics as her repertoire. Evan Ziporyn, one of my favorite Bang On A Can composers, arranged them for cello and an electric/acoustic ensemble. It is one of the best fusions of rock and the new classics I've heard, because it does full justice to Maya's cello expressions, the implications and thrust of the songs, and the idea that there can be a radical synergy between the two stylistic complexes that is fully in keeping with the position we are in today. The choice of songs, to begin with, is excellent. Led Zeppelin's "Black Dog", Howlin' Wolf's "Moanin' at Midnight", Hendrix's "Little Wing", King Crimson's "Epitaph", Nirvana's "Lithium" and so on. These are songs that jump out in the originals and if anything are enhanced by the new treatment. 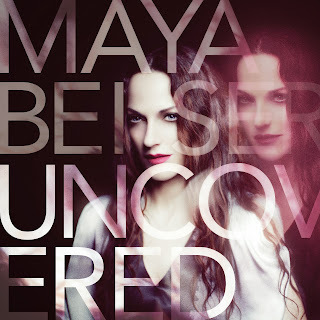 Electric and acoustic bass, reeds, drums and percussion conjoin with multiple versions of Maya's cello. Maya handles the principal melodies as if in a concerted context and she joins with the other instruments creating the stunning backgrounds. Ziporyn and Beiser create nothing short of brilliant music out if it all. Debate is currently raging in the social media right now on how to attract new audiences to new music and classical. This is one very good answer. It is that because it is unforced, an organic totality built out of love and respect for the two stylistic universes, love for the songs, and genuine talent. With any luck it may set tradition on its ear, literally, with total conviction and sincerity. There will still be tradition, of course, but then there will be this album, too. That's the best of all possible worlds in my mind. 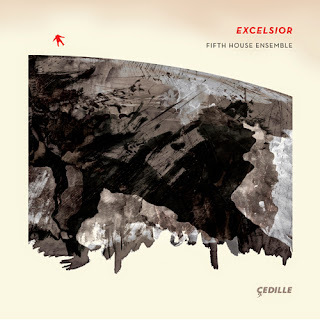 A new Chicago-based chamber group, the Fifth House Ensemble, presents their debut recording Excelsior (Cedille 2014). They come across as a very capable outfit with fine readings of four contemporary works, each work with its own more-or-less post-modern qualities, some rather firmly in the realm of radical tonality. The title work, a short chamber opera by Caleb Burnhans (b. 1980) that was composed in 2012, features an ultra-tonal panorama with some ritualistic repetition and lyrical diatonic matter-of-factness that centers at the end around a folkishly modal part for soprano. When I first heard it I thought Gorecki's "Third Symphony", but after hearing it several more times I came to find its own special lyricism to be accessible, yes, but perhaps a bit more magical in its impact than was apparent on first hearing. Alex Shapiro (b. 1962) and "Perpetual Spark" (2011) has a more dynamic energy to it with a motored minimalist piano part that is both echoed by and contrasted with longer melodic figures in the chamber ensemble as a whole. It does have a spark, lyrically so. Jesse Limbacher (b. 1991) gives us an equally brief "Air" (2012) that brings us a slightly more modernistic palette of tone with some jazzier phrasing and a sound more an extension of Stravinsky's neo-classical and later writing. It has its own life however which the winds of the Fifth House Ensemble realize very nicely. Finally there is Mason Bates (b. 1972) and his five-part "Red River" (2007). This again emphasizes in lyrical ways the diatonic end of the tonal spectrum in parts, but not exclusively so. There are some mobile phrasings that suggest jazz influences, a prominent clarinet part, and perhaps the most involved and pleasing music of the entire album, in terms of complexity at any rate. It is movingly performed here. The Fifth House Ensemble gives us a most fascinating, widely open window on the newer music being written today by the younger generation of composers. There is plenty of substance yet it also is a program that has accessibility. For this reason the album may find its way to those not especially looking for high modernism, who either have been attracted to minimalist tonality or are just stepping into the modern compositional world and need something reassuring. At the same time the musical levels are high, so that someone well-versed in the times will find plenty to like. Harrison Birtwistle has a way with his music that goes beyond English rootedness in that he could be said to belong as much or more to the international school of modern classical, at least in the sound of his more advanced works. 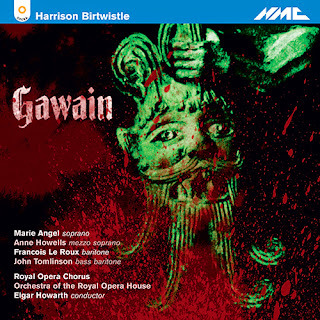 You can hear that on his opera Gawain (NMC 2-CD) which has recently been reissued as performed admirably by the Royal Opera Chorus and Orchestra under Elgar Howarth with excellent soloists. They premiered the work in 1991. It is based on the King Arthur legend, and since the PDF I received with the work is causing the merry devil with my computer, no doubt due to my computer as much as anything, that more or less is all I will say here. The music itself is high expressionist, high modernist and quite compelling. Certainly it is one of Birtwistle's major offerings. The Royal Opera performance is exceptional. Beyond that my computer is acting up badly so I must cut this review short. I am very sorry. Those who follow closely the English-British new music scene may know the work of composer Edward Gregson (b. 1945). I have missed him up until now. What we have today is the fourth volume of his orchestral music, Dream Song, etc. (Chandos 10822). The liner notes make mention that the works here show the various influences of Hindemith, Bartok, Vaughan Williams, Tippett, Shostakovitch and Berg. Indeed at various times you can hear that as you listen to the four works composed between 1971 and 2013. The "Dream Song" (2010) starts off the program with a dramatically original modernity. Traces of the Berg of the "Violin Concerto" and symphonic Shostakovitch can be heard transformed into Gregson's own personal framework. Menacing nightmarish passages alternate with dreamy pastoral for a work of considerable orchestrational excitement and a singularly expressive temper. His "Horn Concerto" dates from 1971, though we hear the orchestral version from 2013. The Hindemith influence is out front in angular modulations of fourths and such. Yet even in this first important period there is an assurance and personal stamp on the music. The horn part is played with a rather heroic bravura by Richard Watkins. The premier recording of the recent "Aztec Dances" (2013) shows again, not surprisingly, a stylistic development into the more contemporary modernity. It is subtitled "Concerto for Flute and Ensemble". Wissam Boustany plays the solo part with a good deal of sprightly energy and a great command over the various sound colors Gregson calls for in the flautist's role. The work begins with a mysterious "Ritual Pastoral" part that puts the flute out front against a modern yet translucent orchestral texture. A slow "Fertility Dance" builds from there both lyrically and with "primitive" elements. Rhythmic aspects are prominent. The longer "Ghost Song" movement returns to a mysterious demeanor, only darker sounding with more interjections of brash primitivism. The solo flute part has a good deal of colorful passage work here that has its complement in orchestral response. 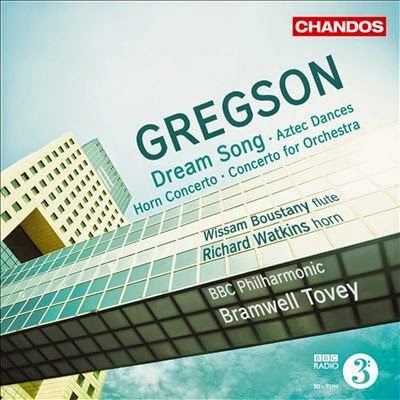 A "Sacrificial Dance" conclusion finds the rhythms more insistent, occasionally (and almost inevitably) referencing Stravinsky's "Rites of Spring", but doing so obliquely as Gregson unravels his strong sense of orchestrational brilliance. The "Concerto for Orchestra" (1983, revised 1989, 2001) is a fitting conclusion to the set, with dramatic late-modernist virtuosity out front, dynamic and excellently wrought. Clearly Bartok's classic work of the same name has given Gregson impetus to do something wholly his. It is an exciting work. So there we have it, four works of note from a genuine artiste-craftsman with a beautiful sense of orchestrational vibrancy. The BBC Philharmonic under Bramwell Tovey do the works full justice, as do the soloists. It is a most rewarding listen from a composer who deserves our attention and admiration. I grapple now and then about which blog to put what. Sometimes a release is so unusual it fits nowhere and everywhere at once. That applies to Michael Hammond's virtual group No Lands and their album Negative Space (New Amsterdam). It is a virtual electro-acoustic album with some guitars, real drums now and again, a helium balloon sounding set of vocals and a huge sound. It's not exactly classical or new music but it is too new music-like to just say "rock" and leave it at that. The sound is so big that I know it will be of interest to those who listen to and appreciate electro-acoustical music, so I decided to put it here. Michael uses very sparingly a sideman or two. Otherwise it is just him and a studio. Songs are the order of the day, harmonically conventional art songs, made unearthly by the arrangements Michael puts together for these presumably self-penned works. And it's the orchestral nature of the arrangements that make this music interesting. I'd call him the Brian Wilson of symphonic space rock, but he is not working in contrasts as much as creating big old clouds. There is no describing the music in detail that would substitute for a hearing. And even then, you must hear it closely to get a handle on it. Suffice to say that the music has a "we are in the future" feel to it as much as anything I've heard lately. That doesn't mean you will like it. I like it quite a bit but not in the sense that I am inside it. I'm looking through a frosted window from the outside and what's going on inside seems good, very good. So I post here because this IS new music, just not what one expects. It may garner a rock following. College stations will no doubt find it cool. As far as you, the reader, is concerned, try to hear a sample. It's post-something! And post-somethings often find their way to this site. It's modern like a space suit. Use your ears as a guide. Ján Cikker? He was one of the most prominent and prolific Slovak composers in his lifetime (1911-89). The liner notes to the CD at hand remind us (though I did not know this) that he wrote no less than nine operas. He was an accomplished pianist and composer of piano music that is at present pretty well-unknown around the world, even in Eastern Europe. Yet the music is excellent. 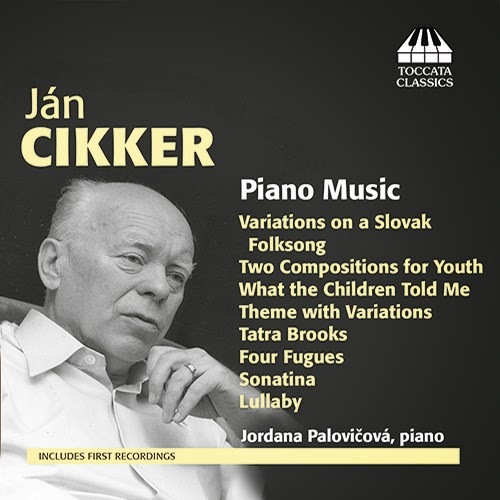 Pianist Jordana Palovičová gives us a most interesting compilation of selected pieces on Piano Music (Tocatta 0270). There are impressionist/post-impressionist elements at play on these works and you can (as the liners again note) discern the influence of Szymanowski and Janacek in the acid-etched dynamism and expressionism to be heard here. There are neo-classical elements here and there as well. We get a spectrum of works covering much of his career, representing the period from 1932 to 1973. There is a development to be discerned, as one might expect, over the long time span in which he composed, with later works having increasingly modern elements that are of his time yet original in scope. Many of the pieces call for a sensory-motor virtuosity, a scherzo-like playfulness and drive that Jordana Palovičová handles with surety. There is pulsating excitement alternating with a brittle lyricism that perhaps makes him recognizably specific to the modern realms current in his region. But he goes his own way nonetheless. There is much to appreciate here, from his take on modern neo-classicism in four of the "Seven Fugues" of 1932-4 to the 1962 "What the Children Told Me" and its highly dynamic, highly varied episodes. This is the sure touch of a composer of high merit. Palovičová has the composer's idiom well-in-hand and gives us performances that do the music justice. A real sleeper. Very recommended. 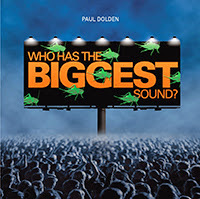 Paul Dolden, Who has the Biggest Sound? When your ears meet the immediate present, the music that notifies you that it is not, certainly, 1910....Nor is it 1930, 1950, 1970, or even 1990....When you hear music that tells you it is 2014, is it a cause for celebration? Perhaps not celebration necessarily, but certainly it causes you to wake up a little bit, take stock of where you are and where we all are. To rethink the possibilities that music holds for us. Electro-acoustic wizard Paul Dolden and his Who has the Biggest Sound? (Starkland 220) has that kind of abrupt contemporaneity. He is a sample creator and manipulator, sample here meaning a recorded sound sequence of any sort. His samples can be quite lengthy (as opposed to the typical use of samples in the commercial music world) or quite short. Most importantly the samples, whether they are borrowed from source materials or fashioned by Dolden himself (I believe here much of it is the latter), are made anew by virtue of Dolden's acoustic-musical vision, his eccentric and unexpectedly wayward combinatory logic, which is the critical element at work here. He combines, electronically transforms and re-sequences diverse sounds into often surprising juxtapositions, for an electro-acoustic orchestral melange that shows extraordinary creativity and a sense of direction. There are two interrelated works presented on the album, the title track "Who has the Biggest Sound?" (2005-2008) and "The Un-Tempered Orchestra" (2010). Both have a jagged abstractness about them, yet an organic through-flow, an asymmetry and also a sense of poetic humor, which is somewhat rare these days. "The Un-Tempered Orchestra" seeks to counter Bach's "Well-Tempered Clavier" by creating something the opposite, a six-movement work that uses non-tempered tuning and is as formally amorphous as Bach was formally ordered and symmetrical in his brilliant way. "Who has the Biggest Sound" is in 15 parts and following the tongue-in-cheek title creates a sonic largess and diversity that adapts and parodies styles at the same time as it has sound-color innovation as its most serious goal. The results in both cases are almost unworldly at times, gamelan sounding clanks, orchestral audio super-exotica, insects, animals, rock chaos, percussion blasts, a cowboy melody, a tango, you practically name it and there's something in there you will find. And the point of all this diverse material is an intent to refabric our perceptions and expectations of what is what in a rather radical way. That he succeeds in creating phantasmagorical universes that give you genuine pause attests to his ingenuity, vision, brilliance even. Paul Dolden shows us that he is one of the most consistently interesting and inventive electro-acoustic composers-assemblers today. He is most definitely a force to contend with here in 2014 and no doubt (I would hope) for many years to come. Like I suspect many adventurous listeners, in my early years I came across the Armenian mode through certain works by Armenian-American composer Alan Hovhaness. I fell quite thoroughly under the spell of the way the music spoke to me. Time went by and an exploration of Armenian folk music followed. Since then I've always been interested in Armenian composers, Khachaturian being the most prominent, but others when I happen upon them. So when cellist Heather Tuach and pianist Patil Harboyan came out with the anthology Music from Armenia (Divine Art 25075), I jumped at the chance to listen to and review it. What we have are 13 works by 20th-century Armenian composers, in some cases specifically arranged for cello and piano, in other cases written for the instrumentation. This is often music in a neo-romantic vein, but nearly always recognizably in a minor Armenian tonality, with typically Armenian tonal phrasing. And of course that's what makes it especially interesting. 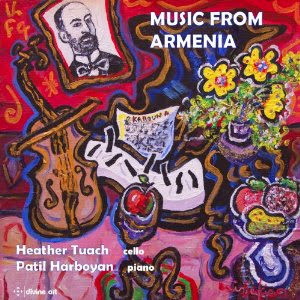 You may or may not be familiar with the composers (I wasn't) depending on your knowledge of the era and region, but they all come through with a flourish captured well by Tuach and Harboyan. The most formally involved work is the "Sonata for Cello and Piano, op. 35" by Haro Stepanian (1897-1996), but the shorter, sometimes folksy works come together as well. We have ten of them by Gomidas (1869-1935), one by Alexander Arutiunian (1920-2012), and one by Arno Babajanian (1921-1983). All told this is a musical program to delight those who respond to the magic of Armenian eastern lyricism. A modernist might find more immediacy in some of the Hovhaness works, but this album is a most pleasing refuge of its own. And the playing is very idiomatic and appropriate. Some music, when properly performed, speaks to us across the centuries. That is especially true of the choral music of Giovanni Pierluigi da Palestrina, especially true as sung by the Sixteen under Harry Christophers. They are now here with a volume 5 of his works (Coro 16124), and it's as good and evocative as all the other volumes, so that the Sixteen are fast becoming the authoritative choice for excellent Palestrina. This volume contains more of the Palestrina that stuns with its contrapuntal beauty, a number of shorter works, the sublime "Song of Songs" nos. 13, 14, & 15, and the "Missa Iam Christus Astra Ascenderat". The Sixteen as always have a lustrous, transparent tone that brings out the counterpoint with vividness. It's easy to praise Palestrina in textbook terms, but perfectly exemplary performances that demonstrate his brilliance aren't terribly common. The Sixteen come though here and in the set as a whole with the balance of voices and clarity so essential to get a proper, moving picture of his genius unfolding in time. This volume is highly recommended, as is the entire set thus far. Generally I find recitation (as opposed to recitative, chanting or ordinary singing in whatever form) annoying. The word-text/lyric is critical. If it isn't something I'd appreciate hearing on its own, meaning some sort of literary work I'd want to hear recited on its own, I don't always find the intervention of musical elements a help or an enhancement. That is, unless the musical treatment is so compelling it transforms the experience, I get antsy. The point is lost on me if there isn't something more to it. If the lyric is sung then there is the melodic element involved and that changes it all; but that of course is not recitation. With those pre-conditions as a general rule of thumb I've found some recitation things in the contemporary realm that I've liked over the years. Not all that many. Like a comedy record they can wear out their welcome quickly unless the musical element is strong. So we have Jerome Kitzke's The Paha Sapa Give-Back (Innova 891), an album featuring two recitations and a chant. It turns out that the album holds my interest. "The Green Automobile" features the prose-poetry of Allen Ginsburg. There is an intricate rhythmic timing of recitation and solo piano that gives you plenty of dynamics and vocal-musical interaction. The piano part fits the text quite well and has its own very attractive way about it. The recitation (by the composer) has great energy and measures out its verbal content in ways rather far removed from everyday speech. In the end, yes, this is good. It's a bundle of almost jazzy energy that appealingly reproduces the frantic quality of the Beat Generation in sound. "The Paha Sapa Give-Back" title track takes us into a zone for modern percussion group with piano, playing with a ritual zeal that reminds of Japanese Kodo drumming. The group vocals put forward energetic chant based on the syllables "Paha Sapa" in various permutations. The third work is the longest at 37 minutes. "Winter Count" features texts by diverse authors, Whitman, Rumi, Aeschylus, Helem Mackay, Harold Pinter, and anonymous. The theme is the horrors of war and the facticity of existence or its lack, filtered though various literary approaches, asides, vignettes. Jennifer Kathryn Marshall does the acting-recitation along with Barbara Merjan on the chant-moments which recur briefly throughout. (The latter also plays bass drum.) The music is played well by the quartet ETHEL. And it's the music that makes the listening especially worthwhile, in a sort of post-modern tonal vein. Somehow Kitzke gives us much more than the obvious here. The musical timing of the words and syllables meshes well with the music for a result that is more than just interesting. It is original, contemporary, well-executed and holds a certain fascination. I won't say this is a huge favorite with me this year. It isn't that. But it is good. It is an example of something happening now. Something different. On a summer's Friday morning such as this I can't think of a better way to start it than to write about the CD at hand. Gian Francesco Malipiero (1882-1973) was a modern-oriented composer with a way all his own. But even given that, his early Piano Works (1909-1921) (Naxos 8.572517) occupy a special place. That's how I feel after listening closely to the new album by pianist Rira Lim, who does a fine job bringing out the complexities and nuances of the music. Early Modernism fascinates me greatly in any event. It was a period of liberation and discovery. The creative energy released by opening up the harmonic, rhythmic and structural-melodic floodgates was real and filled with potential. Malipiero responded with some very original piano music, of which we have five sets on the recording, two enjoying their first recordings, incredibly. You hear some echoes of Debussy and Ravel, of Stravinsky, now and again, but only referentially. The truth is Malipiero was following his creative inner impetus on these works. He carves out of whole blocks a musical language that took advantage of impressionism's shimmering lyricism and harmonic development and the rhythmic drive of Stravinsky and goes with it to his own turf. There's too much music to get into a blow-by-blow description. Suffice to say that "Cavalcante (Rides)" (1921) and "Tre danze antiche (Three Old Dances)" (1909-10), the first recordings in the set, take their place in the program as fully deserving our attention. They are joined by sensitive readings of "Poemetti lunari (Little Lunar Poems)" (1909-10), "Prelude autunnali (Autumnal Preludes)" (1914), and "Risonanze (Resonances)" (1918). Malipiero was not much of a pianist and he detested the flamboyant virtuosity of the piano music then quite current. But as this album attests, he had a marvelous way of writing music that was quite pianistic, memorable and supremely musical without requiring superhuman pyrotechnical skills. The volume is a treat. Rira Lim gives us a Malipiero many of us do not know, and she gives it to us with real artistry. It makes a fine companion volume to the Gino Gorini anthology of early-to-late Malipiero piano works (see the Novemeber 14, 2013 posting). New music, like the Phoenix, can arise out of the ashes of the old. In today's case that is literally true. We turn once again to the music of Heinz Holliger, as we did on yesterday's post. 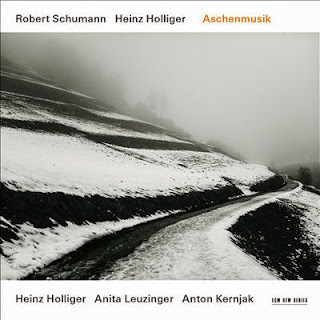 Today we have Aschenmusik (ECM New Series 2395), a program of some superlative Robert Schumann chamber music coupled with Holliger's "Romancendres", a centerpiece, cornerstone work having to do with the destruction of Schumann's "Five Romances for Cello", which Clara Schumann willed and executed at the end of her life, burning it to ashes to ensure it was never published. Anita Leuzinger is on cello and Anton Kernjak is at the piano for this version, and once again it haunts with Holliger's outrage of loss acting as the cement for a thoroughly modern work that incorporates German alphabet transliterations into tone from key words surrounding the event, plus well-integrated quotations from Schumann's works. The resulting music has a Phoenix-like rebirth feeling. This music substitutes for the "Romances" without recreating them (which in any event would be impossible since no trace survives). It is a new Phoenix, recognizable only as itself, a marvelous creature. As good as yesterday's version was (see Wednesday's post), this one has a slight edge for its acoustic-dramatic single-mindedness coupled with ECM's beautiful sound staging design. The music is surrounded by some Robert Schumann chamber gems that give great contrast to the "Romancendres". Heinz Holliger joins with Anton Kernjak for Schumann's lovely "Romances for Oboe and Piano" and the obscure, but fascinating and vital "Studies in Canonic Form", which brings the oboe d'amore into the picture. Finally we get Schumann's "First Sonata for Violin and Piano" with Anita Leuzinger substituting her expressive cello for the violin part, which Schumann had suggested back in the day as a valid possibility. There is much to appreciate in these performances. The sonata is as spirited and lively as you could wish for; the pieces with Holliger have wonderful rhapsodicity alternating with an infectious jauntiness. The romantic Schumann and the modern edgy Holliger-as-composer rub shoulders here in ways that make for a vivid juxtaposition, less a blending than an oil-and-water conjoining, a lava lamp of contrary substances and their interaction. Holliger sounds as beautiful as ever on the double-reeds. Leuzinger and Kernjak show themselves articulate and moving on both musically semantic turfs. Hearing the two styles together with these particular pieces draws out Schumann the musical architect. With him it was never just about feelings. It was about structure. And so it is true in very difference ways of Holliger. It's a recital that sparkles with brilliance. So which should you get? The all-Holliger Haefliger-Vonsattel disk spoke of yesterday or today's Aschenmusik? I can't answer that question for you. Yesterday's album is filled with brilliant music in the high modern camp, played excellently. Today's album gives you the "Romancendres" plus some idea of what the ashes may have contained, a Holliger fixated with what we lost when we lost the Schumann work. It is also excellent. Really, both are wonderful additions and do not truly duplicate themselves. And then you would have TWO versions of Holliger's lucid work to compare and contrast. So get this one and get the other one, too, if you can. You can't go wrong that way. It took me a little bit to realize that Heinz Holliger isn't just a marvelous oboe player who occasionally composes music of interest, but that he also is a composer of real stature. It's been dawning on me gradually. By now I am fully there. That has something to do with two recent releases, the first one today, the second I'll cover tomorrow. Today it's time to look at an album of four works featuring Daniel Haefliger on cello and Gilles Vonsattel on piano (Artist Consort GEN 14330). They begin with "Romancendres for Cello and Piano" (2003), a remarkable work. It is based on Clara Schumann's destruction by fire of Robert Schumann's "Five Romances for Cello" which the composer had written in 1853. She did it at the end of her life so that there would be no danger that it would be published! Holliger takes his personal dismay and horror at this destructive act and creates a dramatic work around it--"Romancendres", or Romance Cinders. Using the German alphabet system of note designations he creates motifs out of words associated with the event, integrates various Schumann motifs into the matrix and otherwise creatively gives us a fully abstract six-movement work coming to terms with the story. It is a vividly dramatic piece with a feeling of transcendence in the end, a consolation that we have a work that in effect acts an an effigy, in no way romantic, but in every way modern and dynamic. Haefliger and Vonsattel give it a passionate and careful reading that suits it well. The rest of the program contrasts with varied works for solo cello--"Chaconne" (1975), and solo piano--"Feuerwerklien" (2012) and the monumental abstract-expressive "Partita for Piano Solo" (1999), a half-hour work of great complexity and fundamental modernity played inside and outside the piano with excellence by Vonsattel. These are high modernist, non-formulaic works of originality and strength. There is a strong inner logic to the "Partita" and the "Romancendres" that heralds a superior compositional mind at work, a composer of great stature to my mind. Haefliger and Vonsattel give the music their considerable all. The record has a vivid presence. It is a marvelous collection of Holliger works no modernist would want to miss. And there's another one tomorrow. Stay tuned. Any reasonably informed classical Anglophile knows about the burgeoning of the modern English composer from Elgar through Vaughan Williams, Holst, Britten, Tippett, Delius, Maxwell Davies and on...but of course there have been others active in the last century that some of us might not know much of, composers who well deserve a hearing. Peter Warlock (1894-1930) is one that I've missed up until now. The Naxos volume Choral Music (8.573227), with the Carice Singers under George Parris, fills things in nicely with a vivid picture of his choral writing. There are 25 short works on the album, illustrating well the composer's idea of creating "a melody of chords". They fit in with English choral tradition in many ways, yet reflect often enough the more advanced harmonic world of Delius and Vaughan Williams, with something of the latter's rustic charm at times. The Carice Singers under Parris have a good deal of sympathy for the music and accordingly give us rousing, spirited versions of the music, at times sublime and angelic. Here and there one or two seconds might have been well-served by an alternate take when the sopranos are reaching for a high note that is just a shade off, where you know they could make it if given another opportunity. These are minor compared to the marvelous job they do on the whole. We are talking about one or two moments in a lengthy program, nothing to mar the excellent overall impression. There are a couple of dandy Christmas carols, which are good enough that for a moment you forget it is August, as it is right now as I write these lines. They should be sung often. But that applies to the choral music on this album across the board. There are true gems interspersed throughout--some very beautiful music. It's all good. Any Anglophile worth her or his salt will no doubt respond as I did. Excellent fare, served up with a relish that is hard to resist! 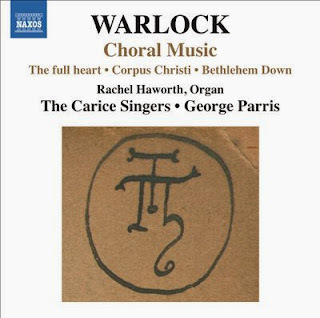 Peter Warlock had a flair for choral writing and you get an excellent idea on this disk. Very recommended. At the height of the classical period Joseph Haydn was virtually the unsurpassed master of the symphony and string quartet. It is certainly true looking back but it was also clear then to those in the know. Mozart studied his music and with the customary brilliance of his mature period produced three quartets of his own, making use of the structural innovations, thematic fullness and developmental acuity that Haydn stood for, at the same time adding his own personal lucidity. We can hear all three in a nicely done set by the Cuarteto Casals, Mozart String Quartets Dedicated to Joseph Haydn (Harmonia Mundi 2186D 2-CDs). The Casals outfit we've happily encountered before on these pages (Haydn and Schubert, see search box). They shine brightly whatever they take on, but have an especially nice way with the classical era. So here we have three Mozart gems, Quartets No. 14, No. 16, and No. 19 "Dissonances". The open bars of the Dissonance Quartet are some of the most remarkable music of the era for out-stepping the conventional bonds of the time and prophetically looking forward to our own modernity. You might also say the same thing of Mozart's "Musical Joke", but that is another story. My only quibble is that Cuarteto Casals play down the dissonance contained in these few bars just a bit, so they seem a little less shocking to our ears. In any event the dissonance is resolved fairly quickly so Cuarteto Casals are perhaps being more faithful to the overall spirit of the music. And the group makes up for it by splendid readings of all three quartets. This is supremely lively part writing in keeping with Haydn as Mozart extended him, and the Casals outfit shines with a bend of voices that stands out as very well wrought. Their well-measured brio is virtually unparalleled. This is an extraordinarily well-rounded vision of the quartets. Cuarteto Casals do not stint on feeling, but neither do they overstate! And they come through with some exceptional bravura. It's a set of performances that fit our times admirably. The set is not officially out here in the States until August 12, but you can pre-order it on Amazon. Paste the following link into your browser to do that. http://www.amazon.com/Mozart-String-Quartets-K428-465/dp/B00K1Q3VQ8/ref=sr_1_1?ie=UTF8&qid=1407170278&sr=8-1&keywords=cuarteto+casals+mozart Or go to itunes and get all or part of the set as a DL. Right now one track is available. On August 12th you'll be able to grab the whole thing. 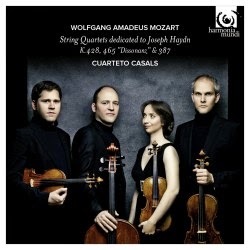 https://itunes.apple.com/us/album/mozart-string-quartets-dedicated/id895053816 Very recommended. My initial involvement listening to the music of John Cage generally followed a three-tiered sequence. At first I listened and did not understand, then I delved pretty deeply into his musical philosophy and familiarized myself with his methods for each work I was hearing, then finally I learned to love most of the music as sheer listening, realizing that all performances were not equal but that the performer's artistry had a great share in the outcome, often as not. 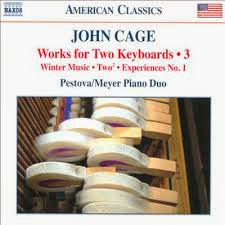 The Pestova/Meyer Piano Duo are excellent Cage interpreters/realizers, judging from the second volume of Works for Two Keyboards and now the third, just out (Naxos 8.559728). (I've yet to hear the first). I reviewed the second volume on these pages this past May 5th. I was captivated by how Xenia Pestova and Pascal Meyer handled the works. I am again feeling this way with the third and final installment. By now our general familiarity with Cage's various periods and intentions are such that there is a generation of performers currently active who approach his music without hesitation, as music. In the past some performances were brilliant but others came off more as experiment than full-fledged composition. It's of course in the nature of Cage's view and performance instructions that any given performance can often differ widely from another. That's in part the beauty of his Zen-filled outlook regarding sound, but it also means that some performers find their way to a realization that satisfies where perhaps others may not do as well. Pestova/Meyer give us some excellent versions of three works by the late composer on volume 3, separated widely in time but going well together. "Winter Music" (1956-57) was his breakthrough work on indeterminacy. It is meant for between one and twenty pianists, each with 20 pages of notation that they make a free selection from, with performers choosing the duration and attack of the notes given. Pestova/Meyer give us a 12-minute version that is filled with a dynamic, contemplative two-way dialog which works quite well. "Two-2" comes from late in the composer's career, 1989, and gives the two performers a spontaneous, open-ended choice on the timing and duration of the written notes. Both works call for creative performers who have developed some sort of vision for what they will do. There is no question that Pestova/Meyer have opted for a sensitively musical, aurally aware, yet very pianistic solution to both works. They are quite obviously attuned keenly to the sensual properties and potentialities of the widely varied note clusters and give us performances that glow in a thoughtful way. The final work, "Experiences No. 1" from 1945, has that diatonic Satie-esque aspect of the composer at its finest. It is a three-minute morsel that is played with finesse and leaves you wanting more. The best Cage performances do that, of course. His oeuvre has a virtually infinite range of possibilities all-told, and the duo gives us some very fine, acutely attuned realizations of key works that make you wish they did some more of the repertoire for us. Perhaps later. This volume is pretty nigh indispensable for the Cage enthusiast, for the modernist acolyte, or even for someone who doesn't really know or understand Cage well. It is convincing because it is so musically pianistic. Highly recommended!